Complete your look with the unquestionable style of the DSQUARED2® 251 Tennis Sneakers. Strong and genuine leather upper. Lace-up front tie closure connected through D-ring reinforced eyelets. Brand logo embroidered leaf emblem featured on pull-tongue. Vibrant stripe detail to each side of the vamp. Product measurements were taken using size 44.5 (US Men's 11.5), width D - Medium. Please note that measurements may vary by size. 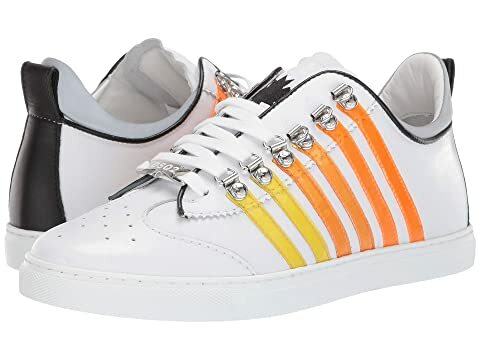 We can't currently find any similar items for the 251 Tennis Sneaker by DSQUARED2. Sorry!